Microsoft launched their Kinect system last week to much fanfare. 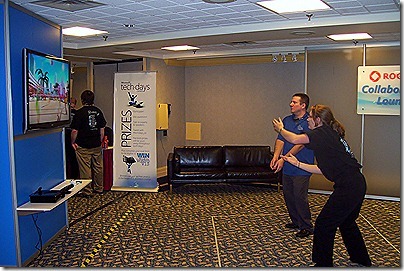 I had a chance at TechDays Halifax to play the new system prior to it being launched. The unit is selling for $$149.00 at BestBuy and Futureshop. I took a quick look on Kijiji as well and found someone trying to sell it for $250.00 on there. I guess they are hoping it sells out and someone has to buy theirs. As it stands now, there appears to be stock at both those retailers’ stores based on their website information. Here is a picture I took at TechDays of Marco Shaw and Michelle from NSCC playing volleyball. Marco also held the bowling score record at 218. Everyone who had a chance to play the Kinect really enjoyed it. I know this is cliché but the Kinect is definitely a game changer for the gaming industry.